The Region of Crete – Rethymno Regional Unity this year joins forces with the Municipality of Rethymno creating a new institution, the “Cretan Diet Festival” to promote local products and Cretan culture. By marrying these two successful local events, we attempt to highlight the potential and prospects arising from the exploitation of comparative advantage for Rethymno and the whole of Crete, the “Cretan Diet”. It is a nutritional model that goes beyond the borders of the island, enjoys international recognition from the medical and scientific community and represents a lifestyle and a culture. The “Cretan Diet” is a growing opportunity for the island and its inhabitants, a driving force for the local economy, the primary sector and tourism. It is the best representative of our island in Greece and the world and a valuable ally in our effort for openness, competitiveness of the local production and increase of tourist activity. This week we send this message from Rethymno across Crete and we celebrate the Cretan Diet through an exhibition of local products and a series of cultural and informative events. We invite you to celebrate with us. 19:00: The members from the choir of Atsipopoulo Secondary School and Episkopi Secondary and Higher School sing for the Festival.Conducted by Elli Perisoglou. 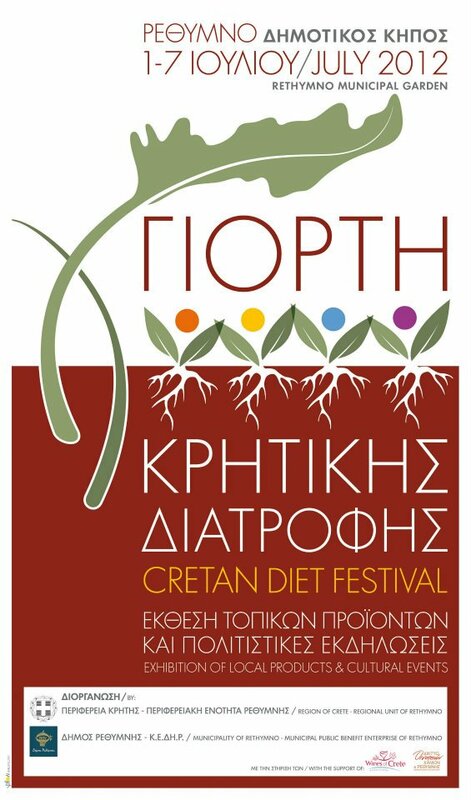 20:00: Inauguration of the Cretan Diet Festival 2012. Greetings from the Rethymno Vice-Governor Mrs. Maria Lioni and the Mayor Mr Giorgis H. Marinakis. 21:00: Cretan traditional music and dances from Lyceum Club of Greek Women and Haris Nikiforos’ band. Participation by the Cultural Association of Zoniana village with the children’s folk dance group “Ori”. 19:00: A warm welcome for the little guests from Aerostato kids club. Gogo the Storyteller tells folktales from Crete and then our little friends dramatize the story. 20:00:The children’s choir of the Hellenic Conservatory «Karderinakia» presents songs of Greek composer Giorgos Zambetas. 20:00: The children’s choir of the Municipality of Rethymno sings modern Greek composers, under the direction of conductor Isidora Chalkiadaki. 20:30: Mr Kiriakos Μassalis will help you get acquainted with the plant and its products in an interactive way. 21:30: Cretan traditional music and dances from folk dance group «Delina» with Alexandros Angelakis (Nantis) and his musicians. 19:15: The Museum of Contemporary Art of Crete has organised a pottery workshop for children. 19:30 – 23:00: Exhibition of Local Products.